Almost every foreign person I know contacted me the next day. There WAS a lot of sympathy. As well as HAVE YOU PEOPLE LOST YOUR MINDS???? history repeats itself, first as tragedy, then as farce. I got the same expressions of condolence in the European organisation where I was working south of Frankfurt the morning after the Brexit vote. Sometimes it's an advantage to be a SCOTTISH English teacher;-) Before giving a one-day seminar on my homeland for the German Adult Education authorities, I bought a T-shirt emblazoned with "Keep Calm - it wasnae me!" 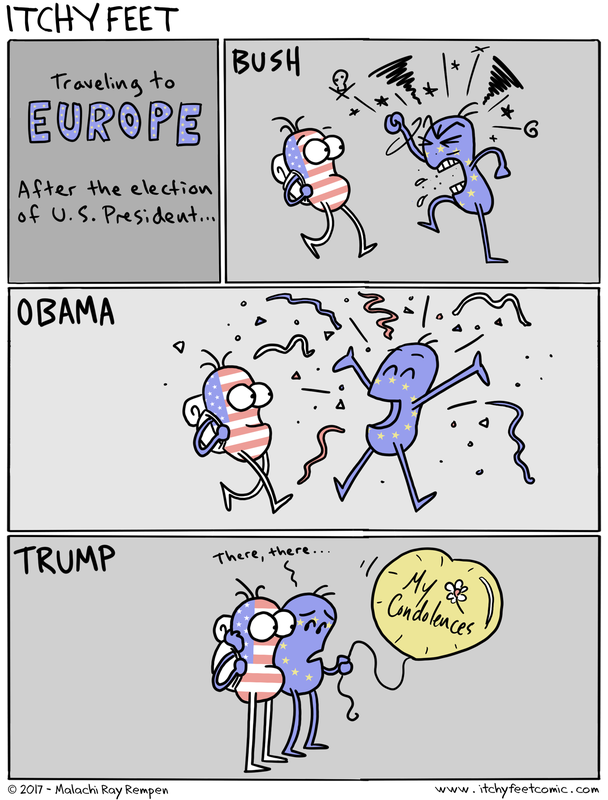 Some Americans care too much about what Europe thinks. We didn't elect the great orange git. The election was stolen. Do they make a "deepest sympathies on the results of your election" card? They reprimand the US while they ignore their own problem with terrorism and pretend to be tolerant of different ideals. Just this morning I read on BBC that according to a recent survey of more than 40000 people in 37 countries, the popularity of the US and its president is all time low: "The survey shows only two of the 37 countries have a better opinion of Mr Trump than they had of his predecessor Barack Obama: Israel and Russia." That should come as a surprise to absolutely nobody.